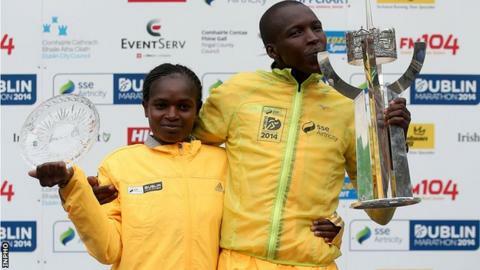 Kenyan pair Eliud Too and Esther Macharia clinched victories in Monday's Dublin Marathon. Too won the men's event in blustery conditions in 2:14:47 while Macharia pipped 2013 champion Maria McCambridge to win the women's race in 2:34:15. North Belfast Harriers' Breege Connolly finished 10th woman overall and was the fourth Irish athlete home. Annadale Striders pair Eddie McGinley and Paddy Hamilton were the fifth and sixth Irish men to finish. There was disappointment for McGinley, Hamilton and Connolly as they just missed out on national medals. McGinley finished in 12th place overall in 2:25:04, just ahead of Hamilton in 2:25:55, while Clonliffe Harriers' Moldovan international Sergiu Ciobanu was the top national runner in 2:21:01. Offaly man Barry Minnock took the national silver medal in 2:22:42, ahead of his club mate Eoin Flynn. McGinley's time of 2:25.04 was only 11 seconds outside the time he set in Dublin 12 months ago which was a decent effort considering the conditions. However, the Annadale Strider was disappointing after going to halfway in his target of 70 minutes. "The distance well and truly got me today and [I was] just glad to finish. "Time to take a step back from training for a while and see where the land lies," added the Belfast man. Hamilton clocked 2:25.55 which was two minutes and 24 seconds slower than his 2013 Dublin mark. City of Derry Spartan Declan Reed placed 15th in 2:26.44 with Pauric McKinney 17th in 2:33.12 and the evergreen Tommy Hughes 25th in 2:36.01. Hometown girl McCambridge came close to retaining her title as she battled Kenyan Macharia to the line, but losing out by four seconds. McCambridge still managed to cut over 60 seconds off her previous best set in Dublin two years ago. Tullamore's 2008 Olympian Pauline Curley took the national silver medal ahead of Clonliffe Harriers' Ailish Malone. Connolly's time of 2:49:37 was just over 10 minutes down on her personal best as the wind took a toll on most competitors. Over 15,000 runners took part in the Bank Holiday event.